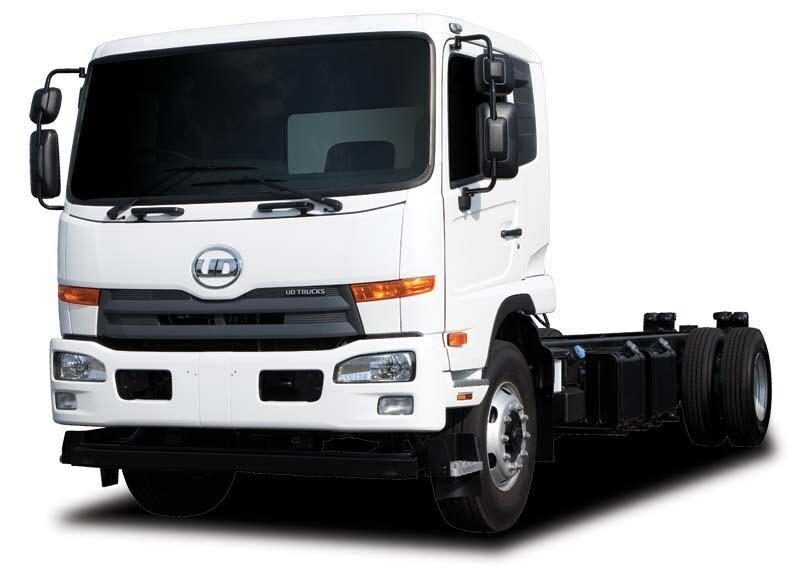 The Brisbane Truck Show was the venue of choice for UD Trucks (previously Nissan UD) to pull the wraps off the MK and PK range of medium-duty trucks. Gary Worrall was there for the big moment. The UD Trucks MK and PK range happily fulfils its requirements in the medium-duty range. Ask any number of operators in the medium-duty segment what the name UD Trucks brings to mind and you're almost guaranteed they will mention solidity, reliability and longevity of models. While the first two are undoubtedly brand attributes, the last can sometimes be a double-edged sword, referring to the long time between model updates in recent years as the company stumbled and struggled to survive. Right in the midst of these struggles, UD engineers in Japan (when the company was still Nissan UD) began drawing up ambitious new models to replace the then-current MK and PK variants. The abnormally long gestation of these new models continued through this period as the company changed ownership, becoming part of the Volvo Group worldwide, which provided the money to not only fine-tune the existing models into more than competent examples of the genre but to finally bring the long-awaited new designs to fruition. The result of these labours, the appropriately-named Condor family of trucks, finally broke cover at the Brisbane Truck Show, after a low-key reveal for transport journalists at a pre-show function. With a total of six new models in the range, plus a selection of four wheelbases and the choice of steel or air suspension, the new UD Trucks offering is one of the most diverse in the medium duty segment. John Bushell, General Manager of UD Trucks Region Oceania, says the new Condor range will be offered in Australia as both MK and PK models, covering a range of weight categories throughout the medium duty segment. 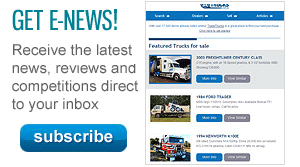 While the new models represent a complete renewal of the medium duty truck range, Bushell says the design also serves to link the complete UD portfolio by incorporating a number of common design elements to establish the familial relationship with the heavier Quon range of GK, GW and CW trucks. Chief among these are the light clusters and front bumper sections that are virtually identical to the heavier trucks, although the MK and PK fronts feature a relocated indicator assembly mounted above the headlights. The new cabs feature a redesigned entry, aimed at making cab access easier, although they share common door mirror units, including a large main mirror set below a smaller convex mirror for blind-spot elimination. Other detail updates include aerodynamic upgrades for improved airflow around the cab-over design, such as slight recessing of the headlights inside the bumper; and making the cab access steps flush with the outer edge of the door and bumper to reduce wind noise and drag. 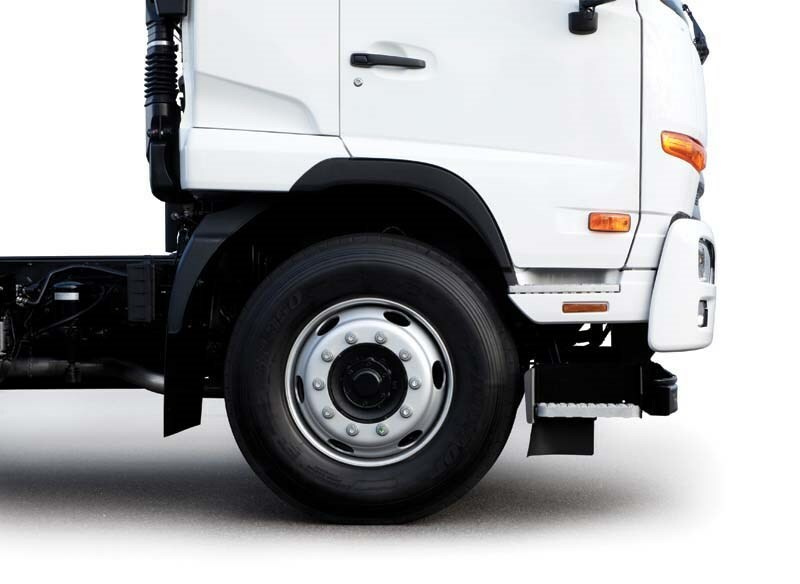 Even the engine cowling has a slight rearward curve to minimise the flat-front effect of the truck, while the door-mounted indicator repeater sits in a channel to reduce drag. 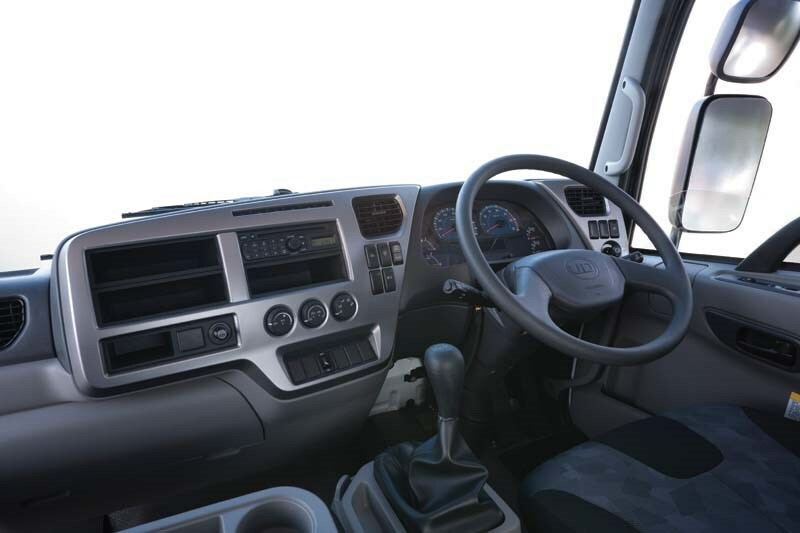 Inside the cab is where Bushell believes most operators will be won over when it comes the new models, courtesy of a significant revamp of the driving space. 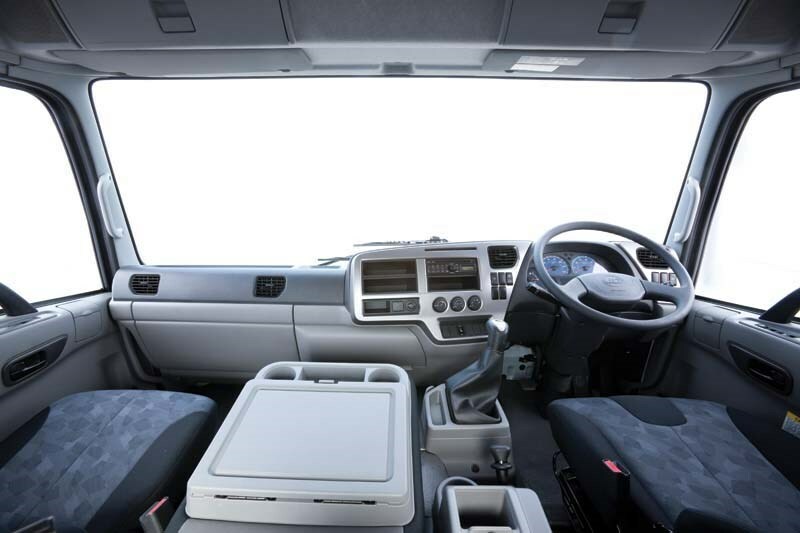 Despite the overhaul, a brief familiarisation shows the key ergonomics of the cabin remain user-friendly, including the retention of large, soft-feel controls for the key functions such as air conditioning, hazard lights and minor controls. With UD traditionally a first choice for buyers in local government and other vocational operators, Bushell says the cabin design reflects the intention to retain this sector while adding other buyers to the mix. 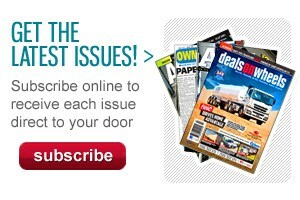 "We are targeting customers on discretionary items, like driver safety and comfort, by adding the items they need," Bushell says. Although not fitted to the trucks on show in Brisbane, Bushell says the production trucks will offer a built in multimedia touch screen, CD player, AM/FM radio, NAVTEQ Satellite Navigation, USB, Bluetooth and iPod connectivity as standard, with the package capable of being optioned with up to three external video cameras. Bushell says UD will offer a transport-based GPS and navigation software package, in addition to UD's first telematics option. Drivers will also benefit from the custom designed CVG driver's seat, featuring an 80mm higher headrest for tall drivers, an adjustable seat damper with seven settings, as well as mechanical height, tilt, seat cushion slide and lumbar control, while the new design increases rearward travel by 25mm for additional leg room. While the external sheet metal has been extensively reworked compared with the older versions, Bushell says the most important changes are under the skin, with the MK and PK now conforming to the much stricter Euro 5 emission standards required by ADR 80/03 regulations. 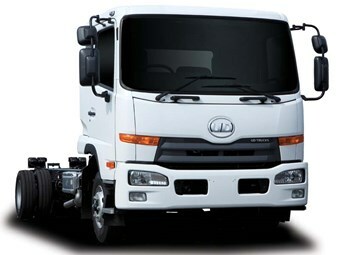 The Condor range uses the new ECO Fleet power plant, a 7 litre, six cylinder, common rail turbocharged and intercooled diesel engine, completely designed, developed and manufactured in-house by UD Trucks in Japan. Speaking at the Brisbane launch, Klaes Svedberg, head of UD Trucks, says the new engine has attracted attention from Volvo Group engineers impressed with the design, with the engine set to appear in future Volvo models elsewhere in the global market. The new engine offers two power ratings, either 180kW/716Nm or a more powerful 206kW/883Nm, both using the same 7 litre, six cylinder unit. Responding to the challenge of meeting ADR 80/03, the new engine meets the tough Euro 5 emission regulations using just selective catalytic reduction on its own, without a particulate filter. In another positive for operators, UD have set the engine service intervals at 30,000km, reducing the time spent in the workshop for maximum productivity, while the 50 litre AdBlue tank should see MK operators get 2,500km between fills, the more powerful PK should still manage at least 2,000km between fills. Although a powerful and torquey engine is a boon for operators, it is the ability to put this power to the ground that can count for more in real world driving, a point not lost on Bushell. He says the new models will offer a range of transmission options, starting with a six-speed manual for the MK in both the 180kW and 206kW models, along with an Allison 2500 automatic in the 180kW version. The heavier PK models, with GVMs of 15- and 16- and 16.5-tonnes and GCMs of up to 32 tonnes are available with the Allison 2500 auto in the 15 tonne 180kW model, the six-speed manual, shared with the MK, in the 180kW manual, as well an Eaton 9-speed synchromesh manual or an Allison 3000 Series automatic in the 206kW version. 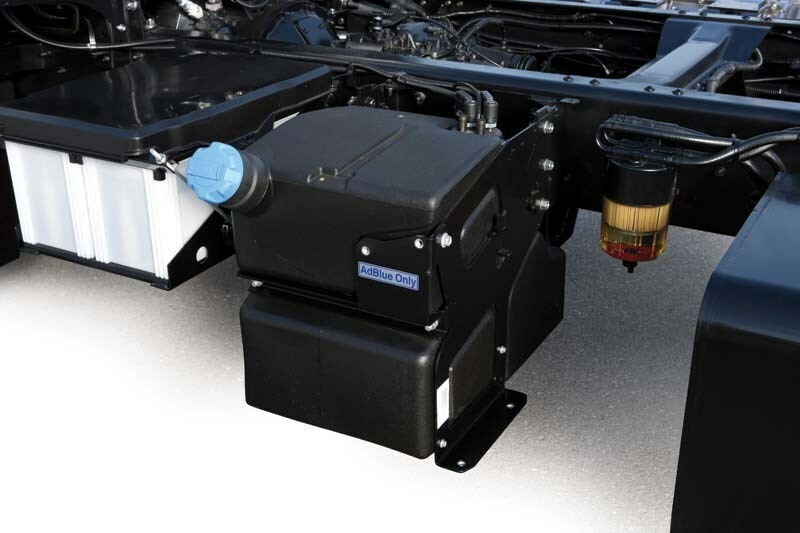 The new driveline packages can also be optioned with Power Take-Off at the rear of the engine, which Bushell says can be fitted by either a dealer or customer, and is suited to any wheelbase or transmission option. The new models also introduce a new naming convention for UD, with the trucks identified by the model, followed by the weight capacity and then the horsepower figure, so that an 11 tonne GVM MK with 180kW referred to as an MK 11 250. Other models in the base range are the MK 11 250 Automatic; MK 11 280; PK 16 250 Automatic; PK 16 280 and PK 17 280. While truck manufacturers always try for the longest possible lifespan to help recoup design and tooling costs, this can be made difficult by regulators imposing ever-tighter emission rules, which in turn mean modifications to fit additional hardware. In the case of the new Condor models, Bushell says UD engineers were able to anticipate requirements through to the end of Euro 6 regulations and design the chassis so that any extra emission-control hardware can be fitted without requiring modifications. He says in real terms this gives the Condor a design life through to at least 2020, sufficient time for a successor to be planned and implemented while the current truck repays the initial investment. 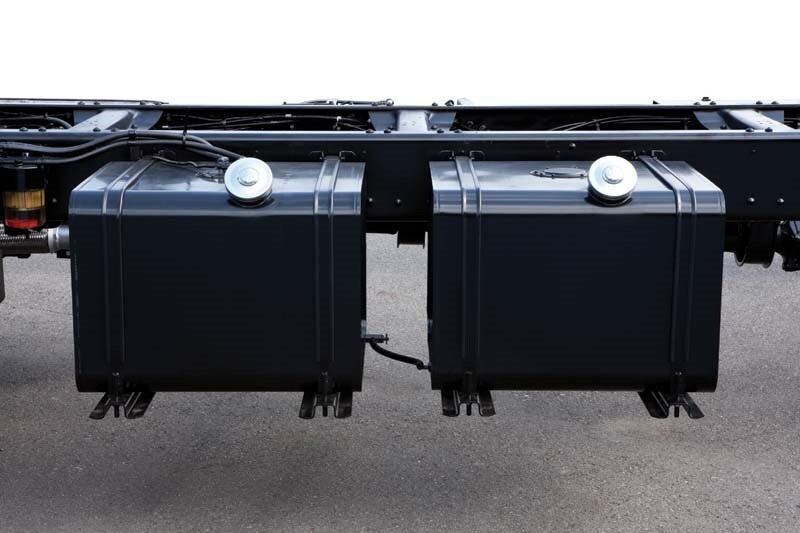 The chassis also features flat rails, a move Bushell says allows body builders to adapt existing designs to the new truck without requiring significant engineering changes to accommodate chassis elements. As well as being easier to work with, Bushell says the new chassis is both stronger and lighter than its predecessor, with strength increased by a claimed 22 percent, while the 6,450mm wheelbase version is 50kg lighter and 1.5 percent stronger. The standard fitment FUPS front end is not only safer in the event of a crash with a passenger vehicle, Bushell says, but also increases the front axle loading to the legally permitted maximum of 6,500kg.